Choosing the right home care agency can be a daunting decision, particularly when you don’t know what to expect. There are a lot of companies out there claiming to be the best option for you or your loved one, but how do you know who to trust? Last month in Philadelphia, four men were arrested for stealing more than $700,000 from vulnerable people who didn’t know how to choose a home care provider. These four men solicited from door to door looking for senior citizens, particularly widowed elderly women. They asked their victims to buy-in to their home care scheme, telling them that the services would charge them $1.59 an hour. After they had paid money and signed a contract, the men would vanish from their lives, not delivering the services promised when requested. Over two hundred people fell prey to this bait-and-switch, including some who cancelled their existing home care that was covered by insurance. 1. 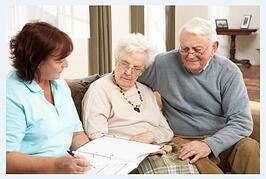 The home care company charges an appropriate cost for their services. The average cost for home care is around $20 per hour. 2. The home care company can direct you to references, including other clients. A legitimate home care agency will likely meet with the client for an assessment of needs before finalizing a contract , as well as introduce you to caregivers. Any home care agency that asks you to sign a contract immediately without discussing care needs or answering detailed questions about their services is suspicious. Tools like a comprehensive home care software or home care system, such as those listed in our next step, allow well-managed home care agencies to match clients with the best caregiver for their needs, as well as store assessment information in a secure location. 3. The home care company uses home care software or home care system to manage care and provide their clients with point of care transparency. If an agency can describe their home care software or home care system to you, as well as how they use this and other tools to manage their business, they are likely a legitimate provider, and perhaps even progressive home care provider. A home care system, like ClearCare, allows seniors and their families to track their care in real time, providing an incontrovertible record of care and progress with an agency. If a home care provider uses home care software such as ClearCare, you can also be confident that the agency’s administrators are present in the care being given. With robust home care software or a home care system such as ClearCare, administrators have constant access to view when a caregiver arrived at the home, as well as tasks that have been addressed or overlooked in a care plan. When you’re looking for a home care service that is right for you, make sure you verify that their prices are in the expected range, the pre-contract process includes an involved discussion of care and a direction to references, and they use a top-of-the-line home care system or home care software like ClearCare. If a provider can satisfy these three requirements, it is likely that they are a legitimate and safe organization to involve in this important life decision. For more information on how to find a home care provider, check out our previous post “Ask These 10 Questions Before You Hire a Home Care Provider."